The past few weeks have been very difficult for me and my family. Aside from the stresses of day-to-day, we lost my father-in-law a few weeks back and that was really rough on our entire family. This was also the first time my 4 and half year old daughter (and 10 month old son) attended a Funeral and of course we had to prepare ourselves for the questions that would be thrown at us. Of course this is never easy — losing someone you love and care for yet trying to keep strong for your children and answering their questions to the best of your ability. Sometimes we question life and why things happen. We wonder why so many bad things happen in this world… especially to good people. Why no matter how hard we work, we still struggle and stress. Why do we stress? Why do we hold onto anger? Why do we find it hard to forgive… and forget? We have enough problems to deal with as it is. We need to start opening our hearts and rekindling our spirits. Finding the good in all circumstances and counting our blessings. I read somewhere that if you were to throw your problems in a pile of others’ problems, you’d probably grab yours back. You can never take back moments lost… cherish each one. Especially with those you love. Use your time and energy to do what makes you happy. And never cease the opportunity to tell those you love how much they mean to you. Of course the first book I grabbed in my hands during this rocky time the past few weeks was Chicken Soup for the Soul. I happen to have been sent their latest book which is the 20th Anniversary Edition and it couldn’t have come at a more fitting time. You will find hope and inspiration in these 101 heartwarming stories about counting your blessings, thinking positive, and overcoming challenges. 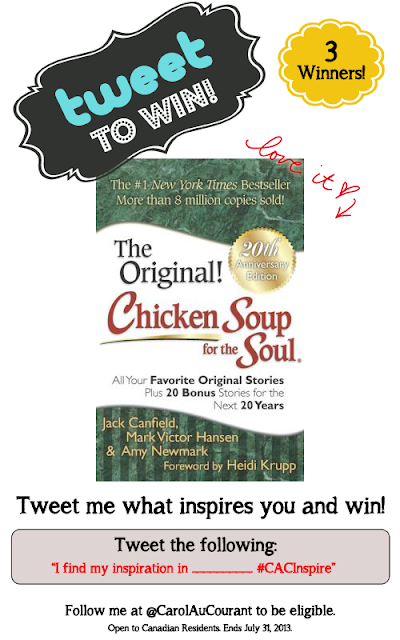 If you’re on Twitter, make sure to enter my Tweet to Win #CACInspire Giveaway to Win 1 of 3 Copies of Chicken Soup for the Soul 20th Anniversary Edition. It is a really lovely book, Marjorie. If you’re not on Twitter, keep posted on more Chicken Soup Book giveaways on the blog. I don’t know how to tweet, however, I would love to win this book, it would be such a wonderful book to read. Imagine readings from the first book ever, wow.